Just thinking out loud! Anyway, I am sharing my fave beauty finds last month. - Whoa! This is an amazing discovery from Korean beauty brand, Peri Pera; it has INTENSE staying power and is Crossfit- approved; takes a while to remove though, but I love, love, love its super waterproof formula! 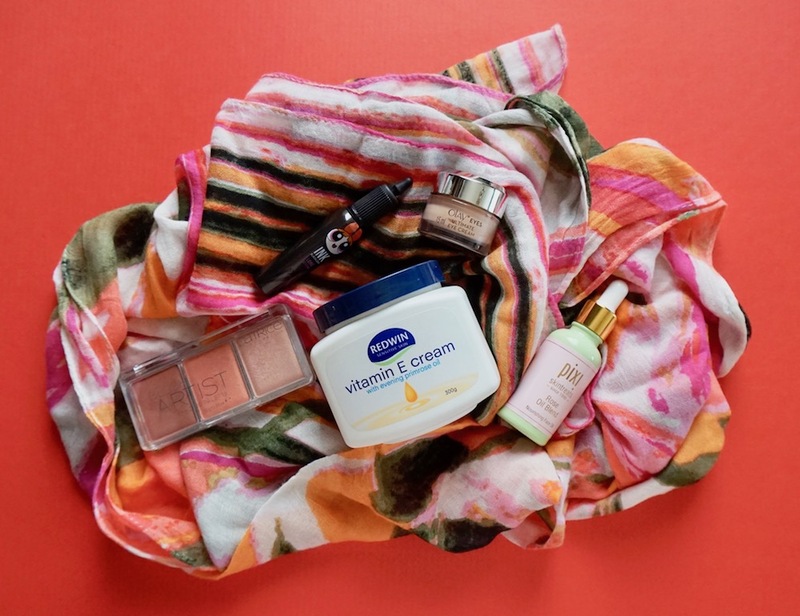 - Finally, one of my favorite drugstore brands has an eye cream! Ultimate Eye Cream is moisturizing, soothing, a bit cooling, and the tinted formula helps conceal dark circles. It's the perfect eye cream to address early signs of aging such as dark circles and eye bags, plus a little goes a long way! I've found the perfect affordable eye cream that's right for my age and skin care needs! - A gem I discovered from Australia. Redwin is great for sensitive skin and provides intense, lasting, yet light moisture; it's a basic moisturizer that does a good job at protecting, moisturizing, hydrating, and balancing the skin. - A grease- free, rejuvenating facial oil with a lovely rose-lavender scent. This one protects my skin thoroughly at night and lets me wake up to refreshed, renewed skin! - A high quality blush-highlighter trio; looks and performs like pro makeup, but isn't price like it! What are you beauty favorites last month? Share! For the month of February, I love to use my Pond's Acne Clear face wash to prevent me from breakouts,SkinGenie Apple Cider Vinegar Toner, iWhite Korea Moisturizer, ZALE Beauty Powder (great for baking too), Badger lip balm, San San Creamy Matte Lip Stain and Maybelline Hypercurl mascara. My everyday stuff that I regulary use. No new beauty finds for me last month except for Ipuda sheet masks which has a lot of essence inside that i also use on my neck and arms. I'm excited for your special day, Ms. Martha. My loved ones missed my wedding day but i walked the aisle with a happy heart and enjoyed the day. My oh so favorite catrice palette that I've discovered from you is one of my newly holy grail fave too!! I super love talaga non, ganda ganda ng color sa cheeks. Nagmumuka akong blooming Ms. M! Thanks to you! Reading your blog not only gives us inspiration, but also a lot of information on the different products you've like and tested! :) My new discovery also for Feb is the Revlon Gold Lippie! It gives me a pop of color in mah lips. Hihi. Thanks again for your recommendation! Malapit lapit na pala ang big day mo Ms M, relax relax ka lang at enjoy the wedding prep with pikachu. My Feb faves are Olay Regenerist Eye Serum and Etude House Moistfull Collagen Cream. 2 in 1 na to at affordable pa. Thanks for this post Ms M.